The following information relates to quilts made by T-Shirt Quilts of Texas® but applies to other quilts as well. Generally, you can wash your quilt in a washing machine in cold or tepid water. If the quilt is large... queen size or larger... you might want to wash it in a front loading machine or at a laundromat in a large front loading machine. T-Shirt quilts should be durable. We have one that has been our store sample for over 10 years, and still looks like a new quilt. Those t-shirts have probably been washed a hundred times, so those are not going to shrink or fade further. If you are worried about the color fading. You can set the color of the backing material by soaking it in white vinegar for about 24 hours. ANY time you start washing in a commercial detergant like TIDE or GAIN, you are going to start the fading process with your quilt. We suggest that you use T-Shirt Quilt Wash for this quilt (or any quilt). It is a non-detergent soap, and will not cause your quilt to fade. However, once you start using a commercial detergant, the quilt will start to fade. NOTE: This is another reason we ask that all t-shirts be laundered before putting into your quilt. Dry in a dryer on low heat, or hang on clothesline. 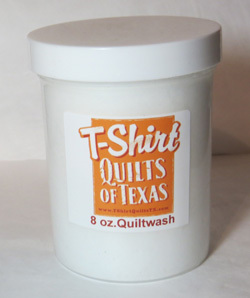 If you use T-Shirt Quilt Wash your quilt will come out soft and fresh smelling with no artificial scents. Really? We stablilize the T-Shirts with a 100% cotton stableizer. Depending on the condition of the shirt, the stabilizer should retard the degration of the shirt. The companies that don't use a stableizer and suggest you use a fray check product are cutting corners. We stablilize your shirt before quilting, and your quilt should last for a generation. Of course, if there was a hole there before we get it, it will still be there. Ask us about doing minor repairs. Well, hopefully you are actually using your quilt and not storing it. But, if you must store it, there are preferred ways to store your quilt. First of all, what NOT to do. Don't store folded quilt directly on wood shelving or cedar chest. If storing, use acid free tissue and specific storage boxes for vintage use. The BEST storage bag is a cotton pillowcase that has been laundered a gazillion times. Those ugly brown spots occur from direct contact to the wood, hence the need for the acid free tissue, or the frequently laundered pillowcase. I use old towels as a shelf liner to line storage areas. These towels have also been laundered (hundreds of times), and provide a nice layer against the wood or the cheap plastic shelf liner in your linen closet. The jury is still out on whether using 'Space Bags" is OK. I have to confess that I have several freshly laundered (and completely dry) quilts stored in the space bags. I am waiting to see if there is any damage. What I am actually finding is that the bags don't hold their 'vaccuum' and the quilts are actually just stored in plastic bags. Probably not good. However, I am pretty sure that any rogue mice or moths are not getting into quilts stored in the space bags.